Just the other day I re-published a review of The Dutchess And The Duke’s debut LP. 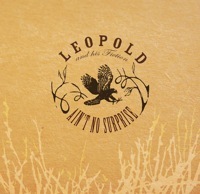 That’s one of the first things I notice about Ain’t No Surprise by Leopold And His Fiction (MySpace) – it has a quite similar sound in the 60s-70s style folk-based rock. There are lo-fi elements here, where the volume is cranked up so loud that it gives the guitar and vocals feedback. The vocals come out more gravely and the guitars more intense. The result is astounding. “Hawk Eyes” instantly stands out as a high point, despite an overall similarity to the power behind practically every song on Ain’t No Surprise. 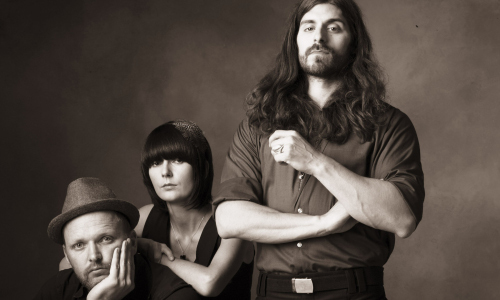 It’s bluesy and filled with various vocal hooks and bar-room riffs. Leopold is more than tavern worthy; they’re downright gritty, filled with enough ferocity to rile up any dive and blow it clean out of the water. “Broke” drives home the light blues reference with some soulful vocals, concluding with masterful guitar-work. The ultimate album high point, if you could even call it that (as Leopold’s sound is so defined and true in every song), would have to be “Come Back (Now That I’m Here)” due to just a hair more ferocity and fervor than a few other of the album’s greats. Though “Pretty Neat” is just that, and finds itself unique as a ballad among full-fledged rock tunes – but that’s its genius. With the greatness behind this album, it wouldn’t be surprising to see Leopold And His Fiction gaining a massive following very, very quickly (if it has yet to happen).